The US Navy will tear a page from one of my favorite 1960's cartoon shows this summer, as it deploys the first ship-borne laser to the USS Ponce. The stated purpose is to protect the vessel from "asymmetric threats" but we know the real reason - extreme coolness. After successful testing last year, the Navy is preparing to deploy its first directed energy weapon to the fleet. When it puts to sea this summer, the afloat forward staging base ship USS Ponce will be equipped with the Navy’s Laser Weapon System (LaWS). LaWS is a system based on a design developed by the Navy Research Lab and engineers at the Naval Sea Systems Command and Naval Surface Warfare Center Dahlgren. 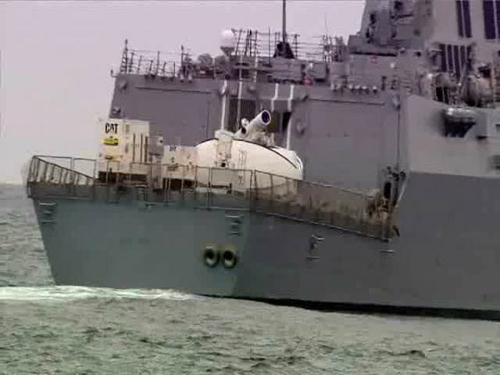 Its purpose is not to vaporize enemy ships but to provide a low-cost way for the Navy to defend against drones, small boats, light aircraft, and missiles at ranges of about a mile. If you'd like, play the following video showing the introductory music to Johnny Quest while playing the above video on the Navy's new laser. Pay close attention around 42 seconds in to see a lizard man operating a ship-borne laser! Hopefully, foes of the US Navy will not bring large mirrors with them - you know, just on a hunch like Dr. Benton Quest. I should also mention the Lewiston from EE 'Doc' Smith's 1934 classic Triplanetary - except that this described a space ship-borne beam weapon. Through the great room the two Lewistons swept at full aperture and at maximum power, two rapidly opening fans of death and destruction... Through the delicately adjusted, complex mechanisms the destroying beams tore. At their touch armatures burned out, high-tension leads volatilized in crashing, high-voltage sparks, masses of metal smoked and burned in the path of vast forces now seeking the easiest path to neutralization, delicate instruments blew up, copper ran in streams like water. Via ArsTechnica; thanks to Winchell Chung and Fred Kiesche among others for recommending this story.